At Apex Access Group, we offer high level window cleaning services for high-rise and multi-storey commercial and residential buildings. Buildings that come under the high-rise category are classed as those that are two storeys or higher. For buildings which are taller, you will need a specialist high level window cleaning service to keep your windows sparkling. In buildings such as skyscrapers, windows can be very high up and so there is obviously a certain level of risk. This risk is minimised by putting in the correct safety measures and having the knowledge and experience to apply the appropriate techniques for a high-rise window cleaning service. Apex Access Group can ensure this to give you peace of mind that the job will be completed safely and efficiently. 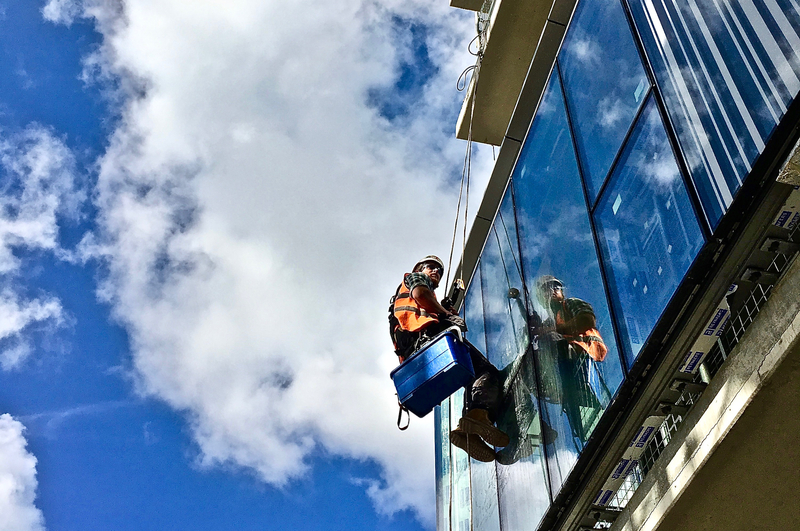 Such window cleaning projects are carried out ladder-free and instead, we provide abseiling or rope access window cleaning across the UK. Based in Derbyshire, we are able to provide a nationwide high level window cleaning service. We utilised the use of IRATA industrial abseiling rope access trade experts to provide a service that is efficient yet carried out in accordance with the highest level of safety standards. For many businesses, work at this height is way beyond their usual cleaning team and at Apex Access Group we can ensure that arranging this job is easy and stress-free, leaving your windows clean and clear.